IFTTT (If This, Then That) has issued a major update to its iOS app with a new location channel that lets you create new triggers and recipes based on when you enter or leave a specified place. The company also confirmed that it has begun work on an Android app that should arrive early next year. 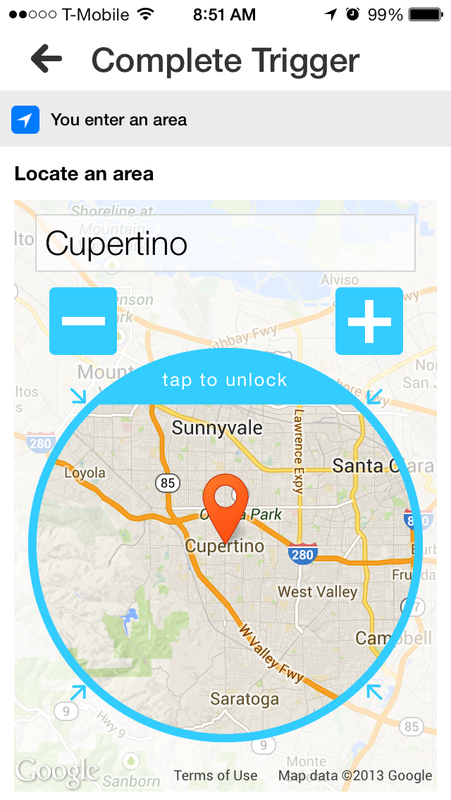 Location support has been one of the most highly requested features for IFTTT. In fact, a third-party developer launched LIFTTT, an app that uses location to activate recipes via email, earlier this week. 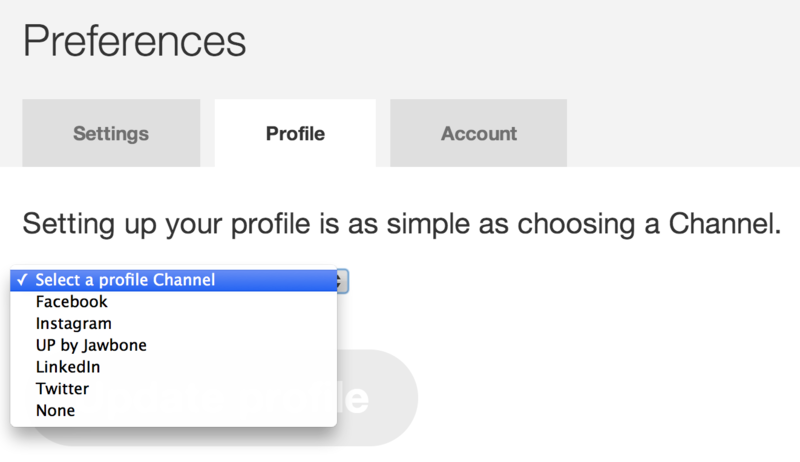 To use the new channel, you’ll need to search for it in the iOS app’s channels section. You can choose whether to have the new trigger fire when you enter, exit or both. You’ll then be directed to a map where you can specify the size of the trigger’s radius. Just like other recipes, you select the action you’d like performed, and then you’re ready to go. You’ll also have the option to choose whether you receive a notification when the recipe runs. 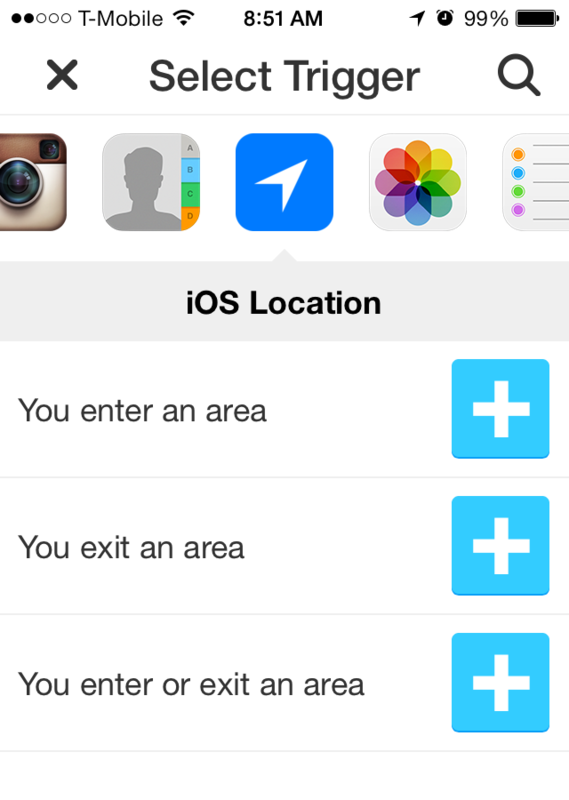 The Facebook, Twitter, Instagram and Foursquare channels have also been updated to allow for location-based triggers. For instance, you can setup triggers based on when you check-in on Foursquare in an area or when Instagram photos are taken at a given location. Location is the biggest update yet for the iOS app, which launched in July with support for photos, contacts and reminders. CEO Linden Tibbets said IFTTT was inspired by the kinds of the creative problem solving that people do in the real world, such as holding a door open with their feet while carrying something heavy. IFTTT is intended to provide the same adaptive reuse possibilities for devices and services that connect to the Internet. “What we’re up to at IFTTT is trying to [ask], ‘How do we allow people to take control over the services, and now increasingly the devices and hardware pieces, in their own specific contexts?’” Tibbets added. Users have taken to IFTTT quite positively, creating more than 7 million recipes. The service sees 6-8 million triggers go off on a daily basis. Adding on a location channel does bring IFTTT much more into the physical world. Early recipes and channels were focused strictly on shuttling information between two Web services, but now IFTTT can be used for communicating with your open connected home devices. IFTTT is also becoming much more social with the addition a new profile feature. Users can earn “top chef” badges for creating highly popular recipes. Profiles will be tied to specific channels, such as Facebook, Instagram, Jawbone’s UP, LinkedIn or Twitter. IFTTT is gearing up to launch its developer platform early next year. Tibbets noted that the startup’s goal is to eventually integrate with “anything that will connect over the Internet.” It’s a gargantuan task, but IFTTT is already off to a pretty good start.